Even though we all want love, sometimes it’s us who break other people’s hearts. Each of us does that in their own specific way depending on the situation. However, when it comes to heartbreaking behavior your zodiac sign can predict pretty accurately how you do it. 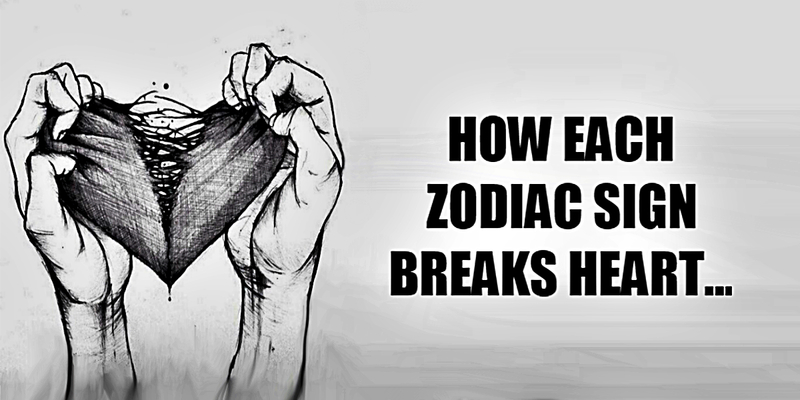 Here is how each zodiac signs breaks the heart of other people! Aries have a short period of attention span and find difficulty for long term commitments. You break other’s heart by luring them into becoming deeply infatuated with you, yet leave them in a span of a few weeks. You are no longer there to witness your partner’s great love for you because you’re already finding someone new after a time. You have a hard time opening up to other people. It’s how you break their hearts. When you decide to open up, you do so in a very slight manner. And when people start to get comfortable with you, you turn cold and shut yourself off. You break the hearts of your potential mates by your inconsistencies. Your unpredictability hurt the stability of your relationships. One day you are warm and loving, the next you are cold and distant. Falling in love with you means an emotional rollercoaster ride. Giving in to the chatter of your family and friends hurt your significant other. One negative comment or remark from your friends or siblings about the person you’re dating discourages you instantly. You then stop to invest in the relationship. Your hunger for attention breaks your partner. You are reluctant to share the spotlight with them and consistently put your needs above everything else, disregarding the needs of your partner. Your indecisiveness breaks your partner’s heart. Because you tend to overthink things out, it’s hard for you to make decisions in your relationship. This makes you stagnant and slow, making your partner unable to wait for you. Your inability to keep up with their pace breaks their heart. As a Libra, you are amiable and a great human being. People love to be around you because of your social prowess. However, you tend to experiment with people’s feelings which will eventually break people’s hearts. While being honest is a good thing, at times it breaks other’s hearts. When you break up with someone, you lack the sensitivity inherent in other people. You seemed unaffected because of your bluntness and frankness. Even then you speak without due consideration how other’s feel. You are a very career-oriented person. Choosing financial and economic security above anything else puts your relationship second place. This breaks your partner’s heart because they feel they’re not on top of your priority. As a planner and a visionary, you like to stick to a rigid timeline that you set for yourself. It’s easy for you to drop anyone who is unable to keep pace with you, breaking their hearts when they fail to meet your deadlines. Your inability to adapt to anything when your plan doesn’t go accordingly shatter other’s hearts. Your intellect breaks your partner’s heart because you tend to make them appear inferior. As smarty pants, you always look for intellectual stimulation from people and couldn’t stand around humans who only offer you small talk. You break your relationship when your partner fails to appreciate your artistic ideas. You don’t like it when you feel your partner doesn’t understand your depth. You break people’s hearts when you find them to be unappreciative of your artistic and intellectual brilliance.